SealTOUGH™ is a family of unique, coextruded packaging films, targeted to replace sealant layers in a lamination or single layers in mono-web applications. SealTOUGH™ provides excellent puncture resistance, enhanced clarity, improved modulus and seals that can exceed 5,000g/25mm. This breakthrough technology gives the down gauge potential of 30%, 40%, or more compared to traditional sealant films. Packaging designs utilizing SealTOUGH™ contribute to a sustainable solution through source reduction and recycling. SealTOUGH™ bridges the attributes of BOPP and blown PE film to achieve enhanced performance benchmarks for clarity and strength. 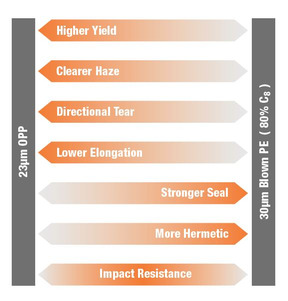 With a three-fold improvement in tensile strength, two-fold improvement in modulus, puncture resistance, and impact resistance, SealTOUGH™ surpasses the current performance of blown PE films including confectionary, snacks, dry fruit and nuts, pasta, rice, bakery items, frozen foods, home & personal care, fresh produce, and dry products.